The Roma professional theatre Romathan - establishment and development until 2002. The theatre Romathan was found by the Ministry of culture of the Slovak republic in May 1992 in Košice. It was first managed by Ms. Anna Koptova (until the end of the season 1997/1998). From the season 1998 the director of the theatre was Karel Adam. 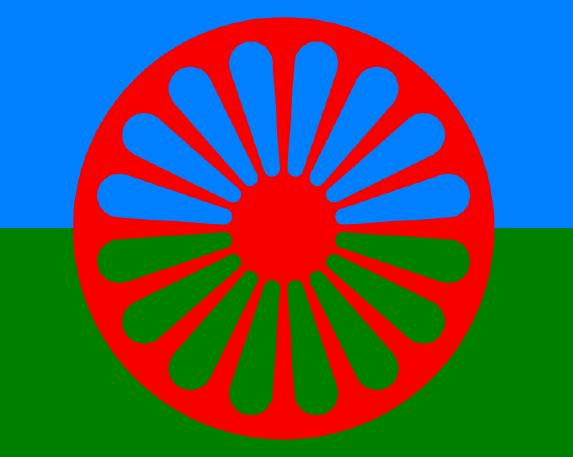 Establishment of the theatre was preceded by the initiative of the Roma as well as non Roma intellectuals with the aim to encourage the establishment of a professional Roma theatre and passing the proposition that led to its existence by the member of the Slovak National Council (SNR) Ms. Anna Koptova at the last December session of SNR in 2001. From 102 present members 53 voted pro. The first premiere of the theatre was the play Than perdal o Roma /Place for Roma by Daniela Hivesova-Silanova (20. 12. 1992). The soundtrack was composed by the first theatre conductor Eugen Brindzak sr.
Theatre management: Art chief: Jan Silan (1992 – February 1998), Juraj Svoboda (1. 4. 1998 - June 1999), Sona Samkova (1.8.1999 - 31.1.2000), Jan Silan (2000) Chief conductor: Karel Adam (1992 - June 1994), Dezider Miko (August 1994 - 30.11.1997), Dezider Balog (1.12.1997 - June 1998), Karel Adam (1.6.1998 – present), Dramaturgist: Daniela Hivesova-Silanova (1992 - 15.9.1995), Daniela Miklasova (1.12.1995 - 31.7.2000). Awards for art work by the Association of Theatre Stage Craft of Slovakia and the Slovak Literary Fund: 1993 Ivana Ferencova and Milan Godla. 1994 - Daniela Hivesova-Silanová. 1995 - Marian Balog. 1996 - Jan Silan. Up to 1993 the theatre aspired to fulfil its mission as a national Roma theatre and was giving performances not only in Kosice but also in Bratislava (For the first time the Roma theatre appears on tour on the stage of Pavol Orszagh Hviezdoslav Theatre on 24.5.1993 with the Slovak president participation). After 1993 due financial difficulties the tour activity was limited to the Eastern Slovak region. The theatre is regularly invited to the Slovak as well as international Roma and non Roma festivals. Until September 2002 the theatre introduced 30 premieres, overall 1,116 performances out of which 178 abroad, while 500 times performed on tour beyond Kosice in whole Slovakia. Until September 2002 the theatre performances were seen by 325, 666 viewers and by 137.799 abroad (See chart). Note: In its first year of existence basic material equipment was bought: tour bus, motor car, basic musical instruments and the sound and light technique. The situation in the theatre which is directly dependant on its financing is drawn by the number of its employees. In the first years of its establishment there were more than 100 employees. In 2002 the number lowers to 37 art employees and 4 technicians and administrators. The administrative department is composed of 2 accountants, 1 secretary and 2 plant workers who secure the theatre activity. Administrators are also a part of the stage craft in certain performances. Up to 1996 the theatre Romathan belonged as many other Slovak and other minority theatre bodies in competence of the Ministry of Culture of the Slovak republic. In 1996 within the frame of national organisational and structural changes on the theatre scene – the Law 222/1996 set its shift under management of regional councils which meant loss of legal subjectivity. From 1st July the theatre became included into a new structure of cultural and education institutions. As a result of the Ministry decision it came under the influence of the Abov Cultural Centre in Kosice. Such a situation was unfavourable from the point of view of its further financing as well as its future mission to fulfil its purpose as the theatre was established as a national theatre. Therefore in September 1996 the theatre filed a complaint against the aforementioned decision of the Ministry of Culture and asks for examination of the decision of the Minister of Culture Ivan Hudec at the Constitutional Court. Together with the Hungarian theatre asks for help The Governmental Council for Minorities. Its legal subjectivity was never returned back to the theatre and from October 1996 it came under administration of the Regional Council in Kosice. From 1st January 1997 the Abov Cultural Centre was renamed as the Regional Cultural Centre and the theatre became its part. This state of things that concerns all minority theatres significantly weakens their activity. The financial allocation for the year 1997 is terribly reduced. As a protest against this state its manager Ms. Anna Koptova resigns on 2nd June 1997 and names Karel Adam its director. The legal subjectivity is returned to the theatre as well as other minority theatres in 1998 by the Slovak government. At the same time it stays under administration of departments of culture of regional councils. After a selection procedure at the Regional Council of Kosice Karel Adam is appointed as its new theatre. Its activity is financed by the Ministry of Culture.